Energy Premier is focused on developing a place where electricity bidding will take only 30 minutes from your time, and you will not have to spend a lot of time working on electricity. We utilize blockchain and smart contracts that bring flexibility and transparency without place for corruption. Blockchain is the world’s leading database software that is distributed and is not managed only by one user. This enables Energy Premier to help to the suppliers and consumers to automatically conclude contracts in easy and safe way and these contracts cannot be changed by another user. The use of the blockchain technology makes Energy Premier completely trustworthy and reliable platform. There are many advantages for both target user groups: suppliers and consumers. For example, suppliers can access many consumers and their offer requests in one place. Also, the bidding process is taking place in real time. Suppliers can take part in the retail market without any employee. They are able to find requests for bids and offers based on their own criteria. On the other hand, consumers can also access many suppliers in one place. They are free to choose their own offer terms for suppliers, for example payment, consumption, etc. Group requests bring many benefits to the customers, such as the possibility of obtaining lower price by aggregating demand. In addition, consumers are able to create their own request, or to join in a group request that often has more chances for better offers. Every Energy Premier user knows how much energy is traded, at any moment. Our platform is connected to the global energy markets and offers direct access to the energy market. All suppliers and consumers can connect from everywhere. Our platform provides individual and group bidding that is traded with our Energy Premier (EPC) Token. The EPC Token is a requirement for trading on the Energy Premier platform, and it offers cheaper and faster trade. Each supplier has to own EPC tokens for successful electricity bidding. There are thousands of suppliers in many countries that make high and strong EPC token trade and usage. 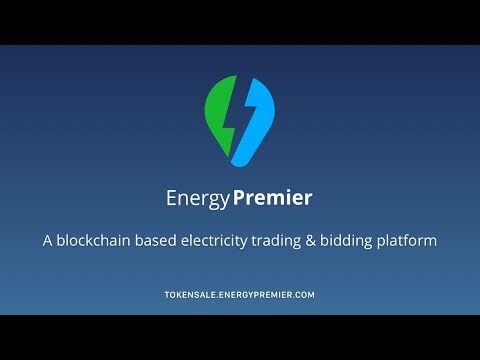 On Energy Premier platform, all users can start their energy bidding in real time based on the EPC tokens. The EPC token increases energy that suppliers and consumers can use, and its value is growing simultaneously with the growth and development of Energy Premier. Our software www.energypremier.com is already developed and it functions properly. We have first built the Energy Premier software before reaching to investors and launching an ICO, in order to provide quality and reliability to our users. We offer an energy portfolio for the suppliers to be able to calculate the lowest percentage of imbalances in the final price, without any risk. Also, energy suppliers are able to participate in the energy market without employees through blockchain and tokens. We are focused on being the first platform that provides direct access to the market for all energy retailers. We believe that our platform will become a global leading electricity bidding platform, because we offer you a friendly, safe, trustworthy place for bidding based on smart contracts through blockchain.